Derbyshire’s Wayne Madsen and Shiv Thakor hit centuries as their side piled up a mammoth score of 574-9 for a first-innings lead of 195 before declaring deep into the final session on day three of their Specsavers County Championship, Second Division clash with Kent at Canterbury yesterday. Madsen’s fifth century of the summer took Derbyshire beyond the hosts’ 379 all out as early as 12.35 pm. Yet the visitors, who have yet to win a four-day game this season, batted on until 5 pm before calling time on their season’s-best total. Even when Thakor departed after posting a 147-ball century, including ten fours and a six, Derbyshire continued for another 12 overs. Derbyshire started the day sitting pretty on 291-3 and, on a pitch that had lost its opening-day fizz, Kent were made to bowl for another five hours in order to claim six more wickets. The home side made their first breakthrough during the fifth over of the morning when Claydon, bowling down the Nackington Road slope, removed Nick Broom (26) lbw with a full-length off-cutter that trapped the right-hander on his crease. Madsen moved to his 22th century in Derbyshire colours with a clipped boundary through square-leg off the bowling of Matt Hunn. It was his ninth four and came from the 183rd ball he had faced. Soon after, left-handed Ben Slater prodded forward offering no shot to one from James Tredwell that clipped the top of off-stump to make it 353-5. Madsen and Thakor combined thereafter to post 144 in 37 overs, setting a new sixth-wicket record for games between these two counties by beating the 136 set by Garnet Lee and Thomas Worthington at Derby in 1926. Madsen’s fun ended after almost six hours when he played across one from Hunn to go lbw for a season’s best 163. 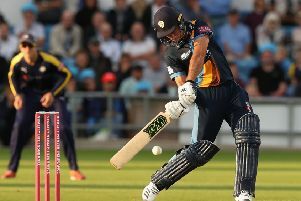 Thakor posted his 147-ball century with a straight six off Tredwell but was then dropped twice in consecutive overs by Alex Blake, first at extra cover and then long-on. Darren Stevens and Tredwell were the unfortunate bowlers. Tom Poynton (eight) miscued to mid-on and then Thakor’s luck ran out when he chipped to mid-on. Yet, with his side 181 ahead, Derbyshire skipper Billy Godleman elected to bat on. Ben Cotton (seven) had his off-stump uprooted by Hunn, eventually sparking the declaration, albeit seven balls later. Despite fading light and a touch of drizzle in the air, Kent openers Tom Latham and Sean Dickson reached 32 without loss before rain took the sides off with three of the day’s scheduled overs remaining. With Derbyshire’s new-ball bowler Will Davis seemingly out of action -- he suffered a recurrence of a hip injury on day two while trying to stop a drive in his follow-through -- the likelihood is the game will end in a draw early this afternoon. But Thakor was keen to push the England claims of his team-mate Madsen, who fired his 22nd century for Derbyshire since arriving from South Africa in 2009, taking him above Chris Adams and to clear sixth in the county’s all-time list. The 32-year-old qualified for England through residency before the start of last season, and Thakor is convinced that the national selectors should take a look.